Need overselling and a lower price? Install these applications in just 1 - click! Create Hosting Packages - Limit Disk Space, Bandwidth, Email, Databases etc. Manage Web Pages, View Website Statistics, Create Email Accounts etc. Comes with Softaculous Script Installer - Install Blogs, Shopping Carts etc. Q. What is reseller hosting? Reseller Hosting allows you to create sub-packages within the allotted Disk Space and Bandwidth of your main Hosting package. You can use WHM to create Individual Custom packages (each with cPanel) and provision them to your Customers. Additionally, you can use WHMCS for billing (Not supported on the base plan). Q. Which Control Panels do I get with a Reseller Hosting package? All Reseller Hosting packages come with 2 separate Control Panels - WHM and cPanel. WHM gives you administrative control of your Reseller Hosting package and cPanel allows your Customers to manage their individual Hosting packages. Q. How can I create Sub-Packages and manage them? Your WHM Control Panel allows you to create individual Hosting packages and completely manage them. Q. What is WHMCS and do I get WHMCS with your Reseller Hosting? 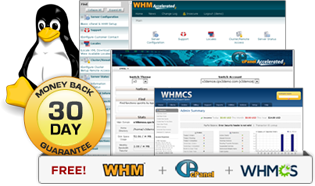 WHMCS is a popular Billing platform used by a majority of Web Hosts. Yes, we do provide a free WHMCS license for all plans except the starter plan. Q. How can my Customers manage their Individual Packages? Your Customers will be able to manage their own packages using cPanel. Q. What are the advantages of reseller hosting? If you're a Web Designer/Developer you can host and manage all your websites/clients with one Reseller Hosting package instead of going through the hassle of managing multiple shared Hosting packages. This also lowers your Web Hosting costs significantly. Additionally, you can resell hosting as a value added feature to your existing business or as a separate entity. Q. Can I upgrade between plans? Q. Do your Reseller Hosting plans include a One-Click Installer? Yes, all our Reseller Hosting plans come integrated with Softaculous - a popular and easy to use One-Click Installer. Q. How is technical support handled? We have a fully qualified Support team at hand to assist you. You can take a look at all our contact details here. However, we do not offer Support to your Customers directly.